May of 2014 was when I graduated and landed a full-time office job. Exciting, right? Ok, I’ll be honest. I was more excited about ditching my old clothes and filling my closet with a new, fashionable, office-friendly wardrobe. I was ready to channel my inner Olivia Pope! But let’s face it - dressing for the corporate world is a pricey part of post-grad life and I certainly did not have the bank account of Serena van der Woodsen. But good news - You don’t have to blow your savings on clothes to create the perfect career wardrobe. Here are a few tips that will help you score that effortless, chic office style on a budget. Many people, including myself, make the mistake of buying an excessive amount of clothing items that are trendy or in style at that moment. If you keep making this mistake, you’ll be buying a new wardrobe every season and end up with an empty wallet. Your wardrobe should consist of several key pieces that you can mix-and-match for a variety of occasions. It’s okay to spend a little money on a patterned blouse that catches your eye (I love polka dots! ), but for the most part, try sticking to neutral colors, like black, navy blue, cream, light grey, and white. An important tip I picked up from reading the book Lessons from Madame Chic: 20 Stylish Secrets I Learned While Living in Paris is that it is much better to have a small wardrobe that consists of timeless, staple items than a closet full of cheap trendy items. I know it is tempting to buy a surplus of inexpensive items, but make the smarter choice and invest in the items that you know you will be wearing recurrently and will last forever. Essentials include: black dress, blazer, black pants, pencil skirt, trench, tote bag, and ballet flats or heels. Take my word for it - Accessorizing is the easiest way to transform an outfit. Nothing spruces up your basic pieces more than accessories. As I mentioned above, keep your core wardrobe neutral and find a necklace, bracelet, or even scarf that can bring some color or spark to the outfit. You can find an array of accessories at any budget, so it is a great way to expand your wardrobe and save a whole lot of money. For accessories, I usually stick to J.Crew - Their outlet has the best sales! Marc by Marc Jacobs is a go-to for watches and bags. Asos.com is my favorite online store. And I absolutely LOVE everything from (RI based) Kiel James Patrick. I rarely pay full price for anything anymore because I know within 2-3 weeks it will be marked down. The white asymmetrical skirt from Banana Republic I wanted to buy a month ago? Just last week I found it on the sale rack, marked down from $79.50 to $39.99 with an additional 50% off. Yay! Sign up for email alerts from your favorite stores, so you get notified about in-store and online discounts. Also, check out retailmenot.com, a site where you can search your favorite stores and get the latest deals and coupon codes. I am a social media crazed, animal loving twenty-something pursuing a career in finance to help pay for my Starbucks addiction (Skinny lattes run in my bloodstream!). Aside from reading the latest celebrity gossip, you will find me spending time with friends, watching bad reality television, and indulging in Jacky’s sushi. 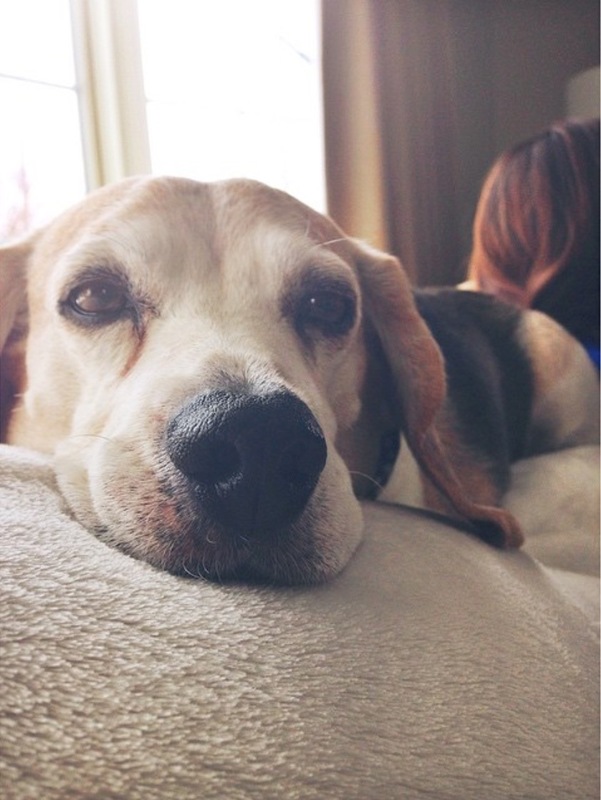 I’m obsessed with my rescue dog (The beagle in the photo above.) and listening to Taylor Swift on repeat. I believe in exercise as therapy and if that fails, chocolate.